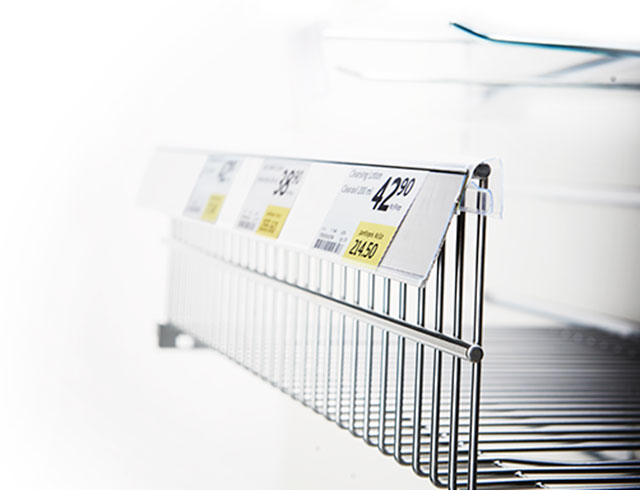 Here you'll find a wide selection of label holders suitable for a variety of shelves. All label holders are manufactured in our own factory in Sweden. That means you can freely choose from our standard sizes or order a custom solution. The label holder is an important information detail that sometimes is not given the attention it deserves. To clearly communicate the price of a commodity is a vital part of the buying process. Sometimes it can be difficult to know which label holder fits a particular shelf. Feel free to contact us if you are unsure. Give us a call or send us an email and attach a picture of the shelf. We can then help you choose among a wide variety of options.